Background: According to the WHO, 603,000 people die annually from secondhand smoke (SHS) exposure, of which nearly 200,000 is in Southeast Asia. India's national tobacco control legislation provides an exception to create designated smoking rooms (DSRs) in certain hospitality sector and airport. Objective: To assess the compliance of DSRs in India's civil airports to national tobacco control legislation and explore the perspectives of key stakeholders regarding its purpose and usefulness. Methodology: A mixed-method study (triangulation design) where both quantitative (structured survey) and qualitative (key informant interviews) methods were used to measure the compliance level of DSRs and to explore the stakeholder's perceptions on DSRs, respectively. Results and Conclusions: Our survey found that all DSRs met with the legislative requirements as specified under the Smokefree Rules. However, nine of the 15 DSRs surveyed were found to be ineffective as they spread SHS in adjacent no smoking areas. Contrary to the prevailing belief that smokers feel an irresistible urge to smoke, our interview results suggest that such urge was entirely manageable even for longer durations. Respondents (smokers) also shared that some DSRs because of poor design and lack of proper ventilation were suffocating and therefore were not a desirable place for smoking. In addition, half of the DSRs violated the tobacco advertising provision. The existing rationale of providing a dedicated space (DSRs) given the operational and public health concerns is questionable. The survey findings calls for elimination of the exceptions provided to smokers in the form of DSRs in public places such as airports. Background: The prevalence of gestational diabetes mellitus (GDM) is ranging from 15.9% to 17% in Kerala. Women with GDM and their offsprings are at increased risk of developing type 2 diabetes mellitus in their later life. Hence, postpartum screening and follow-up of the women with GDM along with nutritional and lifestyle modification support are extremely important in Kerala. This study revealed the clients' and providers' perspective on the postpartum diabetes screening among GDM mothers. Objectives: The study aimed to assess timely postpartum diabetes screening rate and factors associated with postpartum diabetes screening among women with GDM who had recently delivered at selected hospitals in Malappuram district, Kerala. 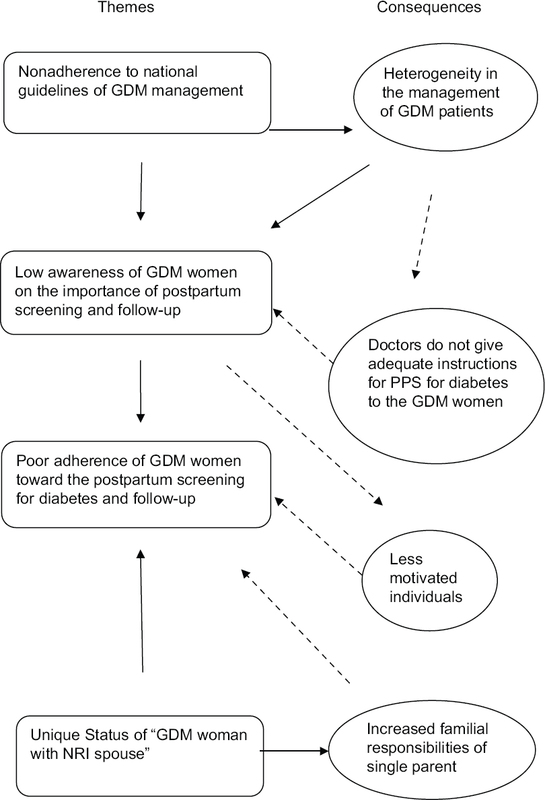 The study also assessed the clinicians' perspective on postpartum diabetes screening of women with GDM. Materials and Methods: A cross-sectional study was done among 200 women with GDM, who had delivered in selected hospitals in Malappuram districts between 9 weeks and 6 months before the survey using a pretested validated interview schedule. In-depth interview was carried out to explore the clinicians' perspective on postpartum diabetes screening of women with GDM. Results: Timely postpartum diabetes screening rate among respondents was 29%. The age-adjusted multivariate logistic regression analysis result had a significant P value for the health-care provider's advice with an adjusted OR of 3.2 (1.4–6.9). About 6% of the women with GDM received appropriate and adequate postpartum follow-up. Conclusion: There is an urgent need to enforce adherence to national guidelines for postpartum diabetes screening and establishment of registration and follow-up of women with GDM through public health-care delivery system. Background: The world is currently witnessing an epidemic of noncommunicable diseases (NCD). Four main diseases account for most morbidities and mortalities associated with NCD and they have four main risk factors in common. The objectives of the study were to estimate the prevalence and assess the factors influencing NCD-risk factors co-occurrence among adults in Ogbomoso, South West Nigeria. Materials and Methods: A cross-sectional study design was employed among 195 residents of Papa-Areago, a suburb of Ogbomoso town. Study participants were recruited using cluster sampling technique and interviewed using an instrument adapted from the WHO STEPS-questionnaire. 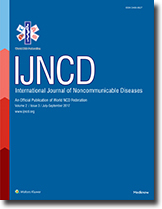 Chi-square test was utilized to compare categorical variables and Logistic regression conducted to assess factors associated with coexistence of NCD risk factors. Results: Mean age of the respondents was 49.6 ± 1.4. Not <81% of the respondents were physically inactive, 7.7% were current smokers, 2.6% engaged in harmful alcohol use, 46.7% did not consume adequate servings of fruits and vegetables, 41.5% had raised blood pressures whereas 35.9% were overweight. 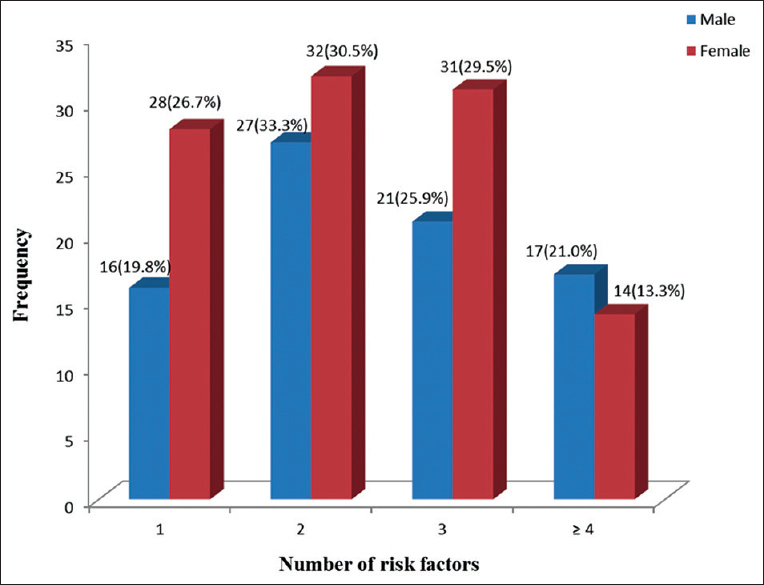 Only 4.6% of the respondents had no risk factors whereas 31.7% of them had at least two risk factors coexisting. The odds of coexistence of risk factors was significantly lower among those in the 21–40 age category when compared to those who were at least 60 years of age (OR; 0.34, CI; 0.12–0.94). Conclusion: The burden of NCD risk factors is high in Nigeria. There is an urgent need for the design of implementable programs targeting the control of these risk factors among Nigerian adults.